Members of the Ottawa Real Estate Board sold 1,660 residential properties in March through the Board’s Multiple Listing Service® System, compared with 1,478 in March 2017, an increase of 12.3 per cent. The five-year average for March sales is 1,339. March’s sales included 358 in the condominium property class and 1,302 in the residential property class. 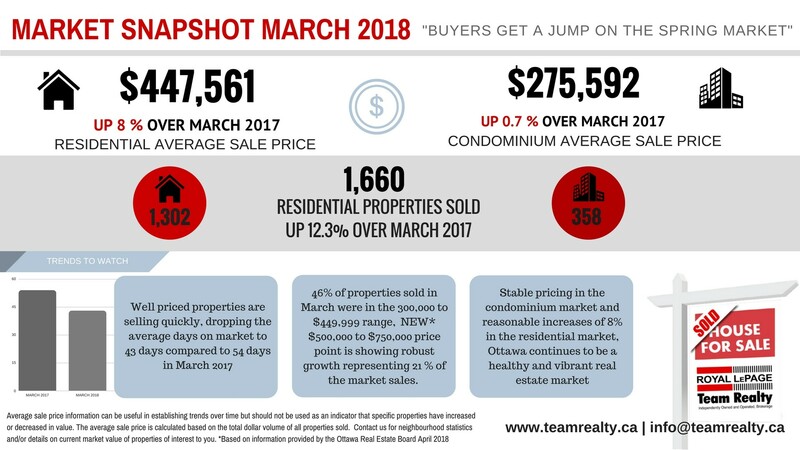 The average sale price of a residential-class property sold in March in the Ottawa area was $447,561, an increase of 8 per cent over March 2017. The average sale price for a condominium-class property was $275,592, an increase of 0.7 per cent from March 2017. The Board cautions that the average sale price can be useful in establishing trends over time but should not be used as an indicator that specific properties have increased or decreased in value. The calculation of the average sale price is based on the total dollar volume of all properties sold. Price and conditions will vary from neighbourhood to neighbourhood. “The most active price point in the residential market continues to be the $300,000 to $449,999 range, accounting for 46 per cent of the market. In addition, the $500,000 to $750,000 market is a price point that is showing robust growth representing 21 per cent of the residential homes sold in March,” Shaw acknowledges. “In the condominium market, between $175,000 and $274,999 is the most buoyant price point, accounting for 51 per cent of the market. We continue to believe it is due to low interest rates and the lack of supply of rental inventory pushing renters into the market,” he adds. “Overall, as a result of the stable pricing in the condominium market and reasonable increases of 8 per cent in the residential market, Ottawa continues to be a healthy and vibrant real estate market,” Shaw concludes. In addition to residential and condominium sales, OREB Members assisted clients with renting 551 properties since the beginning of the year.